Sule Lamido University, SLU Merit and Supplementary Acceptance Fee Payment, Registration Procedures and Collection of Admission Letter for all Freshmen, 2018/2019 Academic Session. 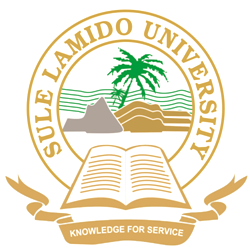 Authorities of the Sule Lamido University, SLU wishes to inform all candidates offered admission into he vairous degree programmes for 2018/2019 academic session that they are to proceed with the Collection of Letters of Admission and Registration immediately. Candidates admitted in the First Batch/Merit Admission List are to begin collection of Admission Letter and Registration are scheduled to commence on Monday, 22nd October, 2018 to Friday, 26th October, 2018 at Room A11, Faculty Building, Sule Lamido University Kafin Hausa. Candidates Offered admission in the SLU Supplementary Admission List are to begin collection of Admission Letters and Registration are scheduled to commence on Monday, 5th to Friday, 9th November, 2018 at Room A11, Faculty Building, Sule Lamido University Kafin Hausa. Admitted Students are to log into their JAMB Profile to accept their Admissions and print JAMB Letter of Admission. Candidates are also requested to come along with their Original Credentials and pay a non-refundable Acceptance fee of Two Thunsand Naira (₦2,000:00) only in favour of Sule Lamido University Revenue Account (Account No. : 0021361788), payable at Unity Bank, Kafin Hausa Branch. Congratulations on your Admission Offer!! !